Well thank goodness for Air BnB because Michelle, with the help of her Maid of Honour, booked a beautiful town house, full of quirky surprises, bright colours, and architectural details that made for the BEST morning photos. Also, Momma Michelle joined, which made getting ready that much sweeter. Jimmy was adamant that he wanted to see Michelle for the first time that day as she walked down the aisle during the ceremony. So we did a mini reveal with Michelle’s wedding party instead. We even got a few tears! I call that a success. Michelle chose soft, muted colours for her wedding day. The bridesmaids wore a light breezy mauve dress, featuring various cuts to compliment each Brides maids’ style. 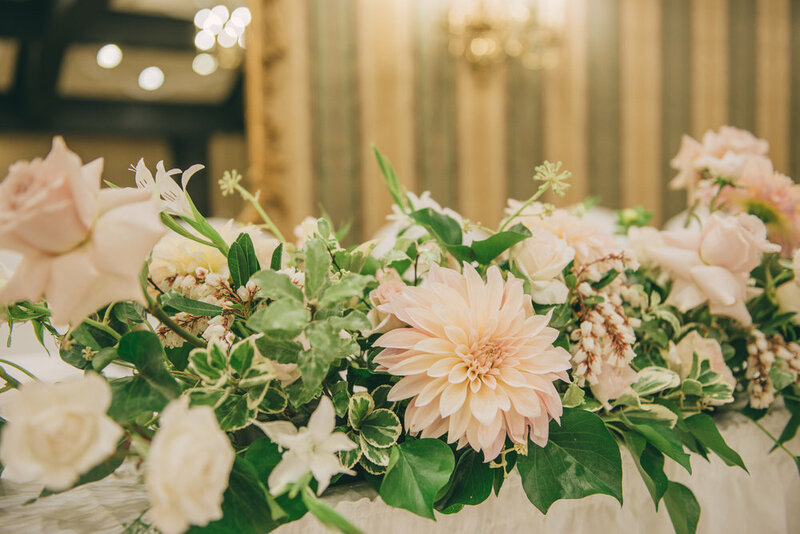 The flowers featured wild greenery and stunning garden flowers like roses, ranunculus, and luscious dahlias. Our stunning bride kept her makeup fresh and bright, with an easy no-fuss hair style. And, so she could dance all night, some bedazzled low-heel strappies. Our Groom, Jimmy was getting ready with his Groomsmen. Cool, calm, and collected; these gentlemen brought the good vibes with them everywhere they went. A set of groomsmen eager to help and on time are the DREAM for any wedding planner. Loved the slate grey suit and brown shoes look for all these gents. They kept it summery, cool, and oh so dapper. Their ceremony was held in the lovely outdoor space at the Old Mill. We had a seriously beautiful day with fresh sunlight and luscious greenery. M&J did not want too much fuss around their ceremony, so they kept the decor simple with two large statement pieces and wild climbing aisle runners. The reception was in one of the lovely rooms at the Old Mill. I love ceremony + reception venues because guests can go straight from the ceremony to celebrating with cocktails without missing a beat. During cocktail hour the wedding party took photos all over the beautiful outdoor grounds of the Mill. The table settings at the Old Mill typically feature pre-plated teacups and that old school napkin-stuck-in-the-wine-glass look. So we intervened and asked for a simple, elegant table setting layout so we could show off our menus, place cards, and party favour. The welcome table was pretty and rustic with an adorable guest book alternative. This glass box will hold their loved one’s well-wishes forever, displayed on their wall at home… how sweet! The addition of the marquee lighting spelling out LOVE was a great way to add some fun to the dance floor and act as a great backdrop for photography! And for a final touch, Michelle & Jimmy had a custom cake topper made, too. Cheers to the Okes! Michelle & Jimmy’s was a dream wedding, in my world! A couple who wants to nothing more than to celebrate their love with their friends and family. The Old Mill was a great setting for their wedding with plenty of outdoor space and a seasoned staff of professionals. M&J have since bought the sweetest fur baby and are living happily ever after in their first home together!